Eleven years of Parker Stevens' life have sped by, the time moving so slowly, he’d assumed he would be in the mental institution forever for the murders he’d committed when he was 15. His days are monotonous and uneventful...until he is released and meets her. She elicits a feeling in him so strong that a power awakens within his very being. He doesn’t recognize himself or understand why the power ignites whenever he’s around her. Either way, Parker knows he’s in love. Luna is trapped. She lives with the man who kidnapped her as a child and subsequently raised her. Now, she’s his lover, a role she is forced to portray and to accept. However, it doesn’t stop her from hating his guts. She remains because she is indebted; she must continue to use herself as payment in order to free her father from captivity. But then she meets Parker, the man’s nephew, and starts to want something...for herself...for once. With featured music by Stumbleine - "She Stole the Beach"
This was my first Yolanda Hatcher novel and I loved it. This fantasy story had me hooked and at the edge of my seat from beginning to end. There was never a dull moment, the story was fast paced, intriguing, well-written and engrossing with twists and turns along the way. The main characters Luna and Parker had intense chemistry and the other characters were all so interesting and had so much to offer. I greatly enjoyed the audible version of this novel. It was Narrated by Anne-Marie Agbodji, Jason Clarke, Amanda Leigh Cobb and John York. They did an amazing job with the characters and giving life to them. The story ended in a cliff-hanger and I can't wait for the next book. I would highly recommend this story. It was a great read. 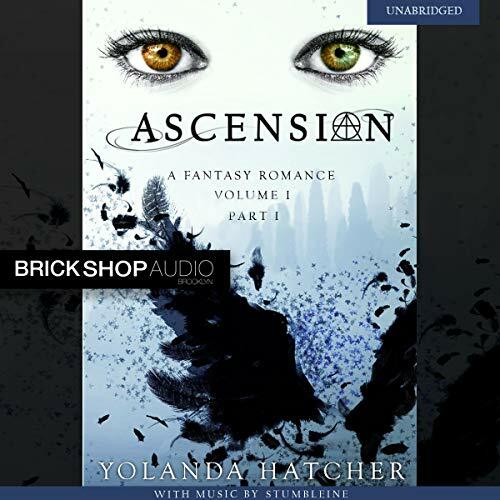 This was my first Yolanda Hatcher's book and definitely won't be the last. This paranormal romance story is really well written, complex, interesting, captivating and entertaining. I love the story of Parker and Luna. Their chemistry is really strong! The other characters are also very interesting. The storyline is filled with twist and turns and the story ends with a cliffhanger. I can't wait for the next book in the Series! The narration is absolutely breathtaking and exceptionally well done. The narrators have a great voice, easy to listen. I really enjoyed my listening. I received this free review copy audiobook at my request and I have voluntarily left this review. This story took me places I never expected. A few surprises I didn’t see coming and the excitement of becoming something greater than you ever thought possible. The perfect combination of sadness, angst, love & magic. My only negative about this book is at times there was so many layers of information and back story that I got confused! It didn’t stop me from continuing and moving on and I’m glad I did. I don’t like cliffhangers but that will not stop me from listening to book 2. The narration was really good except at times the male narration didn’t quite pull off the accent of the female character but again, I didnt care because other than that the narration was amazing. I would recommend this story. It is usually a struggle for me to finish audibles but I loved this one. I like how each character's point of view was read by someone else. The story is just as good as from when I read it. I am so happy that volume two is out so that I can continue the journey! I loved this dark story! How they found each other and their power awakened and sent them to another world. I love all the twists and cannot wait for the next book. Narration was fabulous! Wow, this is my first paranormal/fantasy book and it was really good!! The story is very interesting and it drew me in from chapter 1! I love Parker and Luna! They both had to grow up in terrible situations and it seems they can’t catch a break. The beginning is pretty normal and seems like your typical romance and mid-way it turned into all fantasy. The narration is really good! I can’t wait for the conclusion of their story! Awesome story with twists! Beyond what I expected. Love the narration. Cant wait for Book2! Book2! I never usually leave reviews, but this book was AMAZING!!! Acension is satisfying yet relatable content that'll leave you wanting more. I actually looked forward to my commute because I would anticipate to listen on my ride home from work everyday. Parker and Luna's story just captivated me...I'm super excited for part 2!! I already have the Kindle edition of this book and was so excited for the audible version. This lived up to all of the hype. I really enjoyed this can't wait for the next part. Amazing job Yolanda. I don't normally listen to paranormal books, but this story grabbed my attention from this start. There is some world-building and the dynamic relationships between the characters is engaging. I enjoyed Parker and Luna's story. The multiple narrators really hooked me into the story, as the characters were very well performed and likeable.